Fairview Evergreen Nurseries was founded by my grandfather, Frank Carson Hetz. He was raised on a farm in Franklin Township in southwestern Erie County, but in the early 1900's he was living, with his wife Mary and their four children, in Erie, where he was a house painter by trade. By 1909 he'd been painting houses for fifteen years, and he made a reasonably good living for his young family. He was 33 years old. Unfortunately his health seemed to be deteriorating, and finally a doctor told him that he should stop painting – that he was probably allergic to the lead in the paints he was using. Being a farm boy by birth, Frank wondered if he could make a living back on the farm, so he started to pay close attention to the prices farm produce was bringing at the old Erie Central Market. 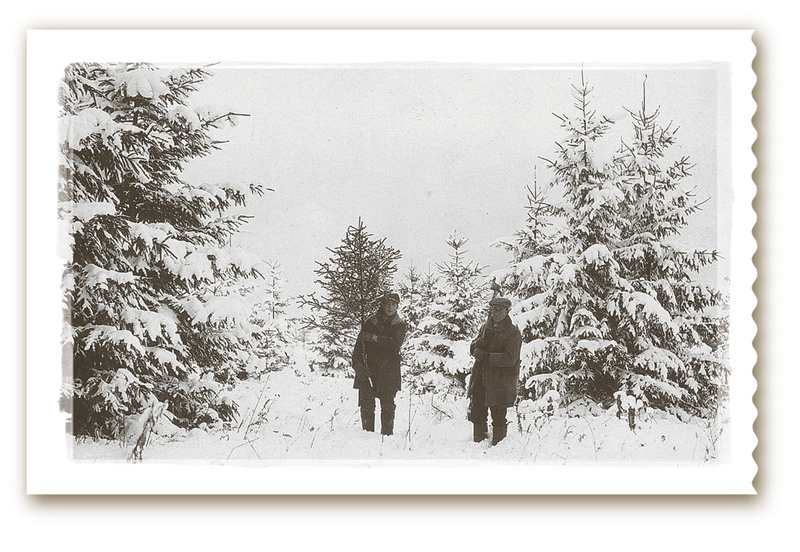 At Christmas time in 1909, so the story goes, Frank took his daughter Mildred to shop for a Christmas tree. He was amazed at the prices they were bringing – 75 cents to a dollar for a good tree. When he counted the rings at the base of the cut tree, he saw that they were only 8 years old. A person with a few thousand of these a year to sell could do very well for himself. His dream was born – he would raise Christmas trees! All he needed was some land in the country, and he found it in Fairview, only a few miles north of where he had been born. He was somehow able to borrow what was, for those days, the tremendous sum of $20,000. To the great amusement of the Fairview townspeople, he purchased the town communal cow pasture – 36 acres of gently rolling ground with a small stream running through it. He started planting spruce, fir, and pine seeds in seed beds in the back yard of his home on Raspberry Street in Erie, and in the meantime worked frantically to get the new land in Fairview ready to plant his seedlings. With lumber reclaimed from a Billy Sunday revival tabernacle he built a barn on the Fairview property. 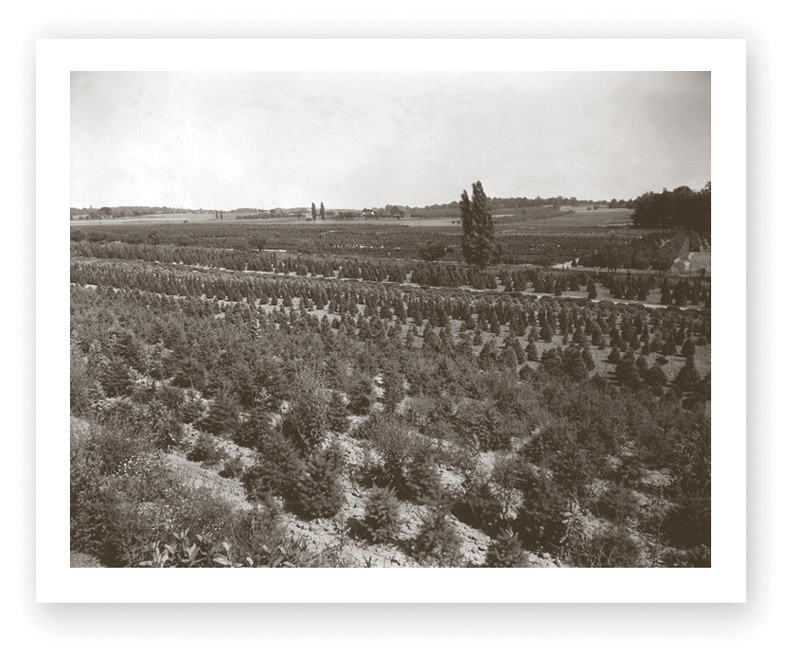 In the fall of 1911 some of the land was ready to plant, and a few Christmas tree seedlings were planted. The barn was finished in 1912, and the Hetz family moved to Fairview to live, in the barn, until they could finish their house the following year. Times were tough. The whole family worked long, hard hours to make ends meet. They raised vegetables and berries to sell, they raised chickens and cows, and they sold maple syrup. All the while they took care of their precious Christmas trees, waiting for the day when they'd be large enough to sell. In 1917 the youngest of Frank and Mary's five children, Neil, was born. It was also around that time when the first of Frank's trees were finally ready to sell. He started to sell them, but not just for Christmas trees as he'd expected. By a stroke of good luck there was a shortage of ornamental evergreens to go around people's houses, and suddenly, right after World War I there was a large demand for them. Sales spurred by this new demand allowed the nursery to expand, and in late 1921 Frank purchased the land across from his homestead, 71 acres, the best farm in Fairview. From the beginning all of the four older children, Mildred, Charles, Leroy, and Clifford, had helped at the nursery. In 1928 Frank formed a partnership with them. By now the business included both retail and wholesale customers. In an effort to increase efficiency, the nursery began to use machinery and mechanical tools extensively. If they couldn't buy them the way they wanted them, they modified them or fabricated them locally.